The lights should be turned off for 3-4 hours after 48 hours' use to extend its service life, otherwise it may be burned and damaged or cause short circuit. Aluminum Housing and Glass Shield: The Plant bulb equipped with aluminum radiator shell for good heat dissipation; the protective glass shield over the LEDs could not only provides protection for the LEDs but also ensures safe using for the user. Energy Saving: 50Watt equivalent actual power consumption of about 15W; High Quality Aluminum With more than 50000 hours lifespan. Cost effective and energy efficient. 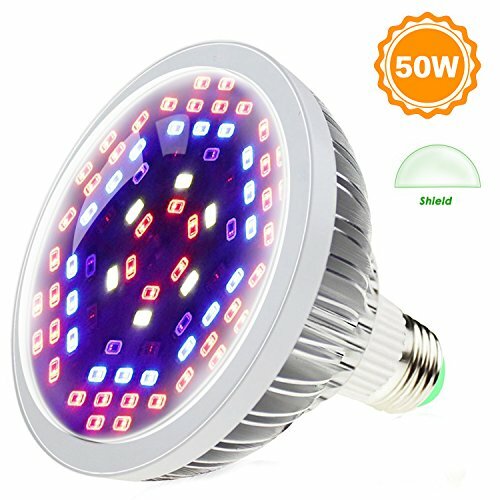 Good for Growing of the Plant: This grow light can rapidly improve the health of plant and growing, generally more leaves popping up within 2 weeks of using this growing lamp on a daily basis. Worry Free Service: Choose us, you not only get the product but also our professional customer support, we provide prompt and courteous after service no matter when you bought them from us. If you have any questions about this product by SHEKAR, contact us by completing and submitting the form below. If you are looking for a specif part number, please include it with your message.